Husband going back to work. God always providing when it seemed there was no way in my human eyes. Watching my children ice skate for the first time and love it. The opportunity for free field trips for my children. A sister who took all of her eight nieces and nephews for a fun day out. My new Christmas gift from my husband, a much wanted camera. Two week break from school to have fun with my kiddos. Seeing new Christians fall in love with Jesus. You have so many blessings here. We all need to just count them daily. It seems God never stops sending His blessings to us. I love your list, and I love that picture. God's blessings are AMAZING aren't they. 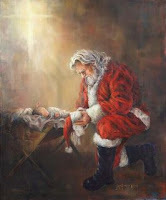 It's Jesus' birthday and yet we're the ones that are getting His amazing gift of love. I LOVE your list, Jenifer! God is just so so so good! Wow. Now why did you have to go and ask that question? ;o) I actually had to sniff because today, I am not feeling very thankful. And then you had to ask that question and I have to answer it with, "I am so sorry Lord. I forgot to be thankful today in the midst of my pity party." *sigh* Going to go and blog my thankfulness right now. Hugs. Love that verse! And a great list this week too! What kind of camera did you get? I want a new one so badly! Thankful today that Jesus humbled himself and took on flesh! O, what an amazing gift!